Some have asked, "Hey Brother Sonny, why all this obsession with Calvinism?" It is my prayer that this series of posts will answer that question. I am convinced that, other than apathy, two of the greatest threats facing the church today are Islam from without (physical threat) and Calvinism from within (spiritual threat). While I have prayed that God would remove this assignment from me, my concern deepens every day. Like Jeremiah, I feel a burning in my bones to expose this false teaching and draw the church back to a unity based upon biblical harmony. Jeremiah 20:8-10 has truly become my counsel. And we will take our revenge on him.'" Some time ago, I received the following message from a young man drawn into Calvinism. "My concern with your posts is the dissension it causes within the body." While I would never create "dissension" just for dissension's sake, it is important to note that most of God's messengers were dismissed by false teachers who used this very same excuse. When you think of me, please remember this phrase, "I WANT the approval of men but I NEED the approval of God!" Peter's words ring loud and clear in the mind of every truth seeker, "We ought to obey God rather than men." Please don't ever fall into the trap of thinking that just because a man's word results in dissension it has to mean he intended for it to be that way. Don't dismiss a man's word simply because of the reaction it brings. Truth is often met with resistance. 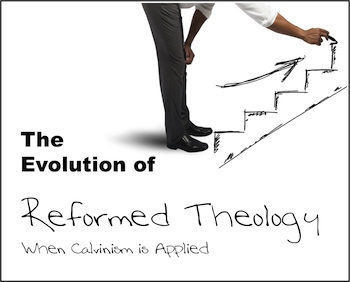 The Evolution of Reformed Theology: "When Calvinism is Applied - Part 2"
Back to Top of "The Evolution of Reformed Theology: When Calvinism is Applied - Part 1"